The Conference was fantastic. I learnt heaps, knitted a lot, met wonderful people, received knitting inspiration, and was taught by some amazing teachers. While I was packing for conference, I carefully placed my camera, and all my Nancy Bush books that need autographing on the dining table (in Hong Kong), and that was where they stayed for the duration of the journey. I only have the photo above to prove that I was there, through the generosity of my friend Sandy. Sandy is a member of the Nordic Heritage Museum Knitters Group (on Ravelry) who extremely kindly offered to give me a lift to the Conference because she lived near my hotel. In addition to being a beautiful knitter, she is also an excellent guide, and a lovely human being. 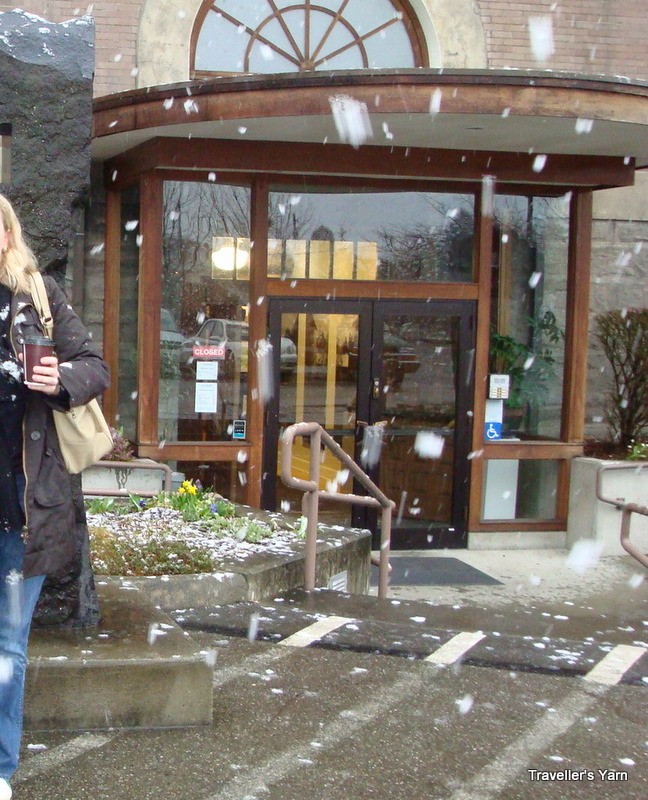 On the Sunday of the conference, she picked me up in pouring rain, and over the course of the drive, the rain became these lovely, large flakes of snow. Unfortunately, I seem to have neglected modelling school in my life experience, and I was pulling strange faces in every shot. The snow flakes were the biggest that I have seen in my life! Nancy Bush has a very precise style, which is well reflected in her knitting patterns. She aims for authenticity in her Estonian shawls, and is clear to let you know when a pattern is not traditional. As the proud holder of an Estonian passport, I am impressed and grateful for her efforts to preserve what would otherwise be a dying tradition. In addition to her historical comments, she was very hands on, and invited us to seek her help when correcting errors. I think that her assistance in correcting my huge number of mistakes was worth the airfare alone; and has given me many more fixing techniques beyond my most frequently used one of ripping back. There was a lot of knitting done on Day 1. Day 2, was Fusion Knitting: Scandinavian knitting inspired by Japan taught by Marianne Isager. Marianne is a complete contrast to Nancy, and taught us really innovative colourwork techniques. Her new book is Japanese Inspired Knits (Marianne Isager Collection) and Marianne had us knitting mitts that were also swtaches for the larger projects in her book. We got to see most of the projects in the book, and I tried things that I had never considered before – shortrow colourwork anyone? Marianne has an amazing eye for combining yarns and colours, and I will discuss the project that she really got me started on at a later date. Marianne is a real source of inspiration, and I will be much more willing to combine different yarns in the future. Day 3, I was back with Nancy Bush making an Estonian Lace Sampler with Laura and Sarah. I actually recognised Sarah from her blog, and I astonishingly showed her how to do a nupp! Nancy spent more time looking at the history and geography of Estonia and showed lots of slides, that I really enjoyed. We knitted a sampler scarf, which I will also blog at a later date, because I intend to finish mine once I clear some of my projects that are 80% done. In a hugely ambitious step of overpreparation, I had three projects with me in my hand luggage enroute to Seattle. Of course, I did not find the time, space, or courage, to fix my Anais top, and it remained firmly folded in its ziploc bag throughout the trip to Seattle, and has remained there since. Similarly, wrestling with dark Kid Silk Haze on an overnight international flight is always going to be tricky, and my ambition to show off my completed Skater’s Overtop was thwarted yet again. My idiocy at pregressing that project is worthy of its own blog post (there are bits where I emailed Veronik Avery…. ); so you can wait for those photos. Instead on the flight on the way over, I completed these socks. When I started these socks I was inspired by this project, and had decided to knit every pair of socks in Knitting Vintage Socks in the order they are in the book, as a learning exercise about different stitches, and heels and toes. At least I started with the Madder Ribbed socks, but then somehow jumped the Lichen ribbed sock, straight to the Yarrow Ribbed Sock. I had planned to make them identical twins, but at some point on the flight, that looked too complicated, and they became fraternal twins instead. Modifications: I made the length of the leg 10.5″ (2 inches longer than specified in the pattern). These socks were worn on day 1 of the Conference, and I found them extremely comfortable. I would highly recommend the Nordic Knitting Conference to any experienced knitters who have the slightest interest in Nordic Knitting techniques. The organisation was exemplary, and the teachers were amazing, and I really appreciated the focus of technical knitting skills. After a very small taste of Seattle, we have decided that our family vacation this year (in late June) will be to the Pacific North-West, and probably have an itinerary something like Vancouver / Seattle / Oregon / San Francisco. I would love advice on places to stay and things to do. As a family, apart from my obvious interest in matters fibery, we also like wine, food, and wilderness, and I would love it if someone could suggest a farm-stay or cabins, or apartments or B and B’s in the major cities. We are not 5 star people, and I have a preference for accomodation with a kitchen, but apart from that, let me know what we should do? I feel the same way after I come back from Knitting Camp (with Meg Swansen). So many ideas running through my head. If you come back to the Northwest for a visit…come to Chicago for a few days. I would love to show you and the family around. Such pretty socks. Oh my. I dearly love visiting Portland. I don’t think you’ll want to leave, esp if you catch good weather. I can only say the obvious: visit Powell’s Books, something for the whole family, and the Japanese Garden. The fabric/yarn stores are outrageous. You’ll stumble upon them just walking around. Next Next post: Do you want to drink this?